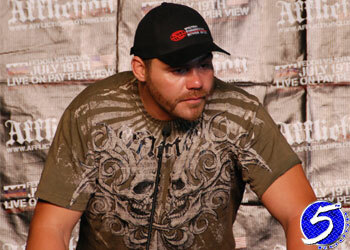 Former UFC heavyweight champion Tim Sylvia will be making his return to the ring on May 30th at Adrenaline III. The only difference this time is that there will be no kicking, knees or takedowns involved as he will be making his professional boxing debut against Ray Mercer. Adrenaline owner and Sylvia’s manager, Monte Cox, confirmed Sylvia’s participation on the event at the Trump Taj Mahal Casino Resort in Atlantic City, New Jersey. Cox is also already in talks with Affliction Entertainment regarding Sylvia’s next MMA fight. They are hoping to compete on Affliction’s third promotion later this summer. Sylvia hasn’t fought an MMA bout since he was humiliated in the 1stRound against WAMMA heavyweight champion Fedor Emelianenko at “Affliction: Banned” last July. It is believed that fellow Affliction alum Paul Buentello will be Sylvia’s opponent if everything works out.